The housing problem never goes away, it’s nature just changes with the crisis. Since the collapse of the housing bubble (which of course heralded the present economic crisis) mortgages have become ever more difficult to get and house prices have continued to increase, putting the dreams of home ownership (so beloved of all governments since Thatcher) out of the reach of many workers. According to a study by the National Housing Federation, the price of the average home in England has risen 94% between 2001 and 2011 and is now on average rising three times faster than wages. With most mortgage companies typically asking for deposits of between 20-25%, the home owning dream will remain for many people just that, a vague dream. (1) According to David Orr, the National Housing Federation's chief executive 'Ten years ago the average amount that you would have needed for a deposit was about nine months worth of salary. Now you need three years' worth." Figures earlier this year showed that owner occupation has fallen to 66% of all households in England, which takes it back to the level of 1989. House building is obviously no longer as profitable as it was in the boom and the number of new houses being built between April and June this year slumped to a three year low. According to the Department for Communities and Local Government (DCLG) only 21,540 new homes were started by builders in the three months to June this year, some 24% down on the same period a year ago and a 10% drop from the first three months of the year. Which begs the question, if they can't afford to stay, where else can they go? Over the past few decades council housing stock has dwindled through a combination of the right to buy and severe restrictions on the ability of councils to build new homes. Social policy has been deliberately formulated to steer us away from being a nation of renters to a nation of home owners, but now the bubble has burst there's no safety net. In 1979 about two fifths of the British population lived in local authority housing. Legislation to increase the right to buy and force councils to transfer their stock to other landlords led to a near halving of the proportion of homes owned by local authorities. Only the most vulnerable will be picked up if they lose their homes. At the moment some two million families are waiting for social housing, often in cramped and unsuitable conditions. Despite Cameron’s declared enthusiasm, it's unlikely that the government will take up such a policy (not least since it will force out many of the capital's low paid workers who rely on subsidised council housing; the last thing the government wants is any impetus to push wages up), but it's also clear that the government, just like the capitalist class as a whole, have no answer to the housing problem. As we write the government has just announced plans to relax the planning laws in the hope that this will encourage builders to build more homes. This has been accompanied by an announcement that £10 billions worth of government guarantees will be set aside to boost the private rented sector in the hope of seeing 100,000 new homes constructed and made available at market rents. This marks a shift away from the previous emphasis on affordable homes (new starts of which were down 60% over the last year) and by moving the focus (i.e. the subsidies) from the construction of affordable housing to that of housing at market rents, the government hopes to encourage the building sector to follow the almost guaranteed profits and thereby boost the economy. The economy of course will be boosted, but only for a lucky few who stand to make a fortune. The losers will be the new tenants faced with high market rents. And next year’s planned cut of 10% in central government funding for council tax benefit will undoubtedly be passed on to those who are low paid or unemployed and who will have to somehow find the money to make up the shortfall themselves (3). According to the Empty Homes Agency some 930,000 homes in the UK are currently empty, 350,000 of which are considered long-term empty i.e. for six months or more, and most of them are privately owned. If these homes were brought back into the housing stock it would almost halve the numbers on council waiting lists. The government has anticipated this logic and its response has been to push through legislation ending squatters’ rights, making squatting a criminal rather than a civil offence, with penalties of up to six months in prison and/or a fine of £5000. The basic provisions of any society are food, clothing and shelter. 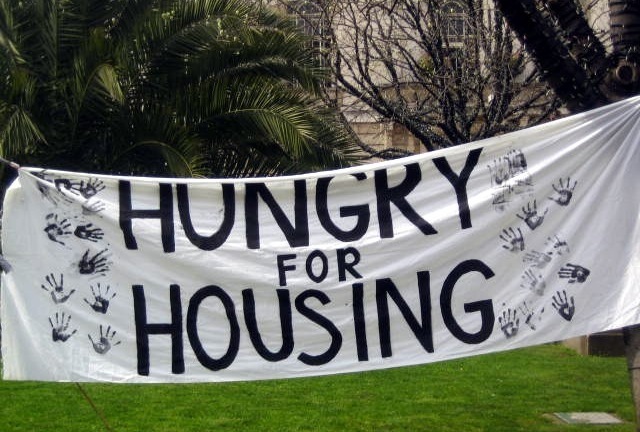 Capitalism cannot meet housing need. Waiting lists are set to grow against a backdrop of spiralling rental costs, cuts in benefits, cuts in social housing, increasing homelessness and mortgage defaults. Despite the propaganda about us ‘all being in it together’, the future looks tough for those who find themselves falling victim of capitalism’s inadequacy. (1) According to the Guardian 18 August 2012 because of the house price increases, a typical family in, for example Copeland in the Lake District would now have to find a deposit of more that £32,000 compared with the £5,000 they could have put down in 2001. (2) According to the Campaign for Better Transport, UK rail fares can be up to ten times those for equivalent journeys in other EU countries. (3) Given the fact that pensioners will be exempt from the proposed council tax benefit cut (the famous salami tactic), the 10% cut will be shared out between less than 100% of those receiving the benefit which means they could end up paying more than 10% of their council tax. This analysis and description of the situation regarding housing is timely and could be useful in assisting workers in evaluating it. Anyone entering the building trade, maybe via an included apprenticeship scheme, probably on a minimum wage, may well be interested in the requirements and prospects of developments here in the UK. There is controversy regarding the possibility of developers embarking on a large-scale and varied set of construction on the edge of the town in which I live, with the question of whether or not planning permission will be granted. Homeless people are begging on the street, a local charity specialises in assisting some of them. It certainly seems that more homes are needed here, even if leaving aside for the moment questions as to how they could be afforded. On the other hand, many existing residents correctly point out that the development would generate yet more traffic on roads that are already crowded and for which spare parking in and around the town centre gets more and more hard to find, and for which the Council steadily keeps an eye on regulations with charges or fines attached. There is also the added factor of air pollution from exhausts. (An international point is that with the massive increase in cars in China, there is a big drive to develop electric cars, according to recent BBC TV). Readers with any influence on planning might campaign for the requirement that every new house or flat should be provided with a minimum of two parking spaces. Why ? Many newly developed estates have narrow twisting roads. Many houses have two adults, each of of whom needs a car to get to work at places beyond convenient reach of buses. But of course the struggle to pay mortgage or rent can make paying for them terrifyingly difficult, let alone owning and running cars. However, as necessity forces many workers to try to do all that, if they can't park outside their homes, the result will be tight congestion by on-street parking, which causes pollution as they drive around seeking somewhere to park, plus the dangers of more traffic around schools at opening and closing times. The steady rise in the numbers of cars on the roads, anyway, makes the whole matter of town and housing and transport planning acutely requiring attention.